Our Wild Birds: Woody is HERE! It has become all to apparent that the woodpecker young have left the nest. Our numbers of all the woodpeckers is WAY UP! We are going through at least 12oz of suet every single day! It has not been uncommon to have four and five woodpeckers waiting to use the feeders - Amazing. Considering the amount of damage that the woodpeckers have inflicted on my home, you may be interested to know that this is my favorite family of birds. 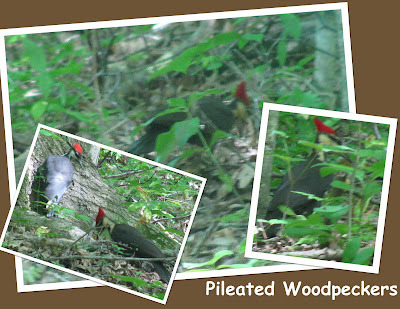 Very exciting - though all of my new sightings are exciting for me - We had 4 Pileated woodpeckers just twenty feet behind the house! Clearly, two must have been juveniles along with two adults. I was unable to get all four in one pic and :::again::: the pictures leave something to be desired, but here they are, and we were pretty hyped seeing them together. 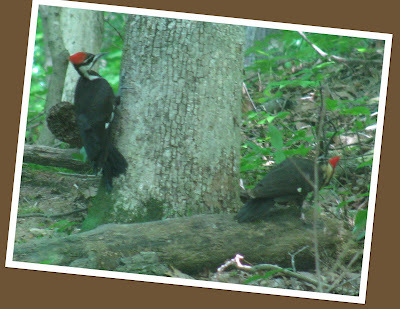 Naturally, they did not visit my feeder - as many of our customers know: Pam's Pileateds never visit the feeder, sure they are around, but they never eat what we offer. We have left our woods very natural - when trees fall we do not pull them out; so, they have lots of dead wood to peck around on for bugs.